Microsoft Outlook is one of the popular email client used for personal and business purpose worldwide. Outlook offers number of user friendly features with other counterparts failed to provide which make it number one choice for email communication. It also allows user to access emails even when the internet connectivity is not available. Outlook stores emails and other user data in a .pst file which is stored at user location, sometimes this .pst file gets inaccessible due to various reason bringing communication to a halt. So it is important to learn how to repair pst file when such situation arises. In today’s article we will look at the various reasons which makes PST file corrupt or inaccessible and methods which can be followed to repair corrupt PST file in Outlook 2016. Large Size of PST file: The limit on PST file size in Outlook 2016 is 50 GB but using Outlook on daily basis for communication the size would increase eventually. When the pst file is big there are problems archiving the pst file which results into corruption of PST file. Virus Attacks: The other main reason of corruption of PST file is virus attack, when we download software from unreliable sources a piece of software is installed with the program you download and make your health and working PST file to corrupt and inaccessible one. So it is always advised to download software from a genuine source only. Use of Unreliable Tool: When the PST file grows big and you use some software from unreliable source to clip the PST file can make your PST file corrupt. There are some free methods to reduce the size of PST file like Archiving, Import/Export and Moving Data to a new PST file. Unclean Shutdown: It is advised to shut down Outlook program properly, Unexpected shutdown of system when the MS Outlook program is still open may lead to corrupt PST file and loss of data. When your PST file gets corrupted from the reason mentioned above or any other unknown reason you are not able to access emails or any other information. To overcome this situation steps is to be taken to repair damaged pst file which are mentioned in next section of this article. Microsoft does provide free Inbox Repair Tool which is also known as scanpst.exe to remove errors from PST file and get Outlook back to the working again. Microsoft Outlook 2016 also include Inbox Repair Tool but the location of scanpst.exe in Outlook 2016 is different from previous versions. Make a copy of PST file ( PST files in Outlook 2016 are stored in Documents\Outlook Files folder if it is anew install. If you have upgraded from Outlook 2007 or previous version the file is hidden at drive:\Users\user\AppData\Local\Microsoft\Outlook). 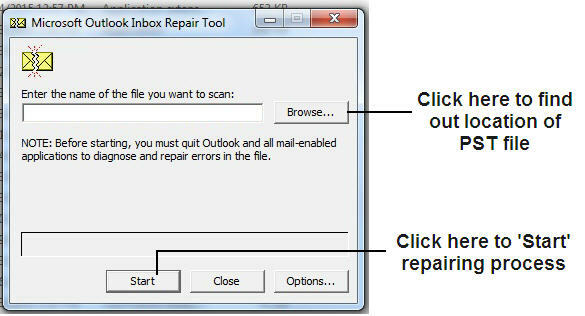 Find Inbox Repair Tool (Scanpst.exe) – The location of inbox repair tool in Outlook 2016 is usually <drive name>:\Program Files\Microsoft Office\Office16. Now Click on “Start” button to repair pst file. After the process is complete you have to open outlook and create new Outlook profile. Now drag and drop recovered items from Lost and Found Folder to your newly created PST file.